There’s not many things that leak out of your car that you can consume safely. Most people just accept this as a sad quirk of reality, but not Doug Martin. Martin is a Ford engineer who’s developed a system to collect A/C condensation and let you drink the resulting water from a tap right on the dash. Pretty cool. We’ve all seen that water dripping and drooling from the bottom of cars in the summer, as the cold A/C lines condense water from the air. Usually, that water just ends up watering the asphalt. Martin’s system (developed with colleague John Rollinger, captures the condensate, routes it through a 0.1 micron filter to remove any organic or particulate contaminants, and then pumps that to a small faucet on the center console. That faucet looks a lot like the one used on dentists’ spit sinks. I bet they just got it from the same catalog. Also, please not the use of the word faucet as opposed to spigot. Spigot sounds like some horrible slur, like the worst thing you can call someone. “You filthy spigot.” Ug, it just sounds terrible. Let’s stick with faucet. The system, which they call On-The-Go-H2O, is capable of producing almost two liters an hour! That’s Big Gulp territory, about 64 oz. That’s no joke. 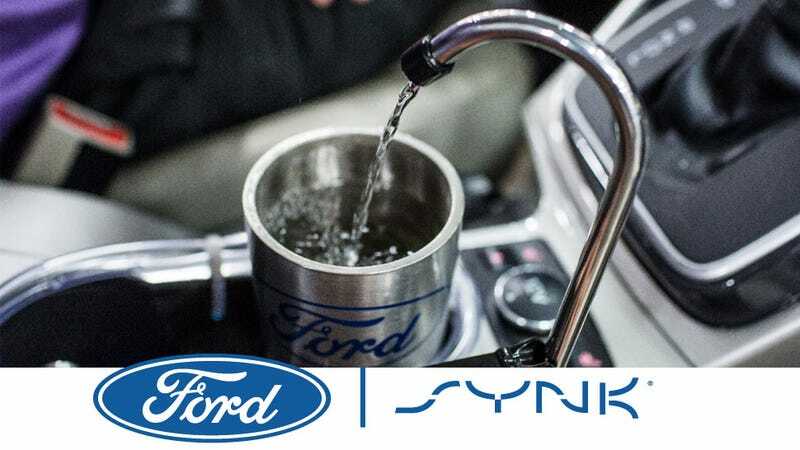 I hope when they name this, they call it the Ford SYNK, so it’s nice and confusing when they talk about Ford SYNC. I like the idea of an integrated general-use water system in a car. Why not route some through the heater core, for hot water, too? Or use it in conjunction with my Urine Management System, or why not have an external access, too to help with car washing, or camping needs? External car sinks have been around before, and they’re fantastic. This could be the killer feature of Ford’s new Aerostar, and, as cars become more and more autonomous, interior features like this become more important. So, I’m very pro-reclaimed-water-sink. Good work. Again, let's not say the S-word. Faucet. Say Faucet.